The Final Fantasy series have been close to my heart since I’ve been its avid fan for years. Recreating the scenes within the game has been one of my career goals in shooting cosplay. Yuna was certainly no exception. 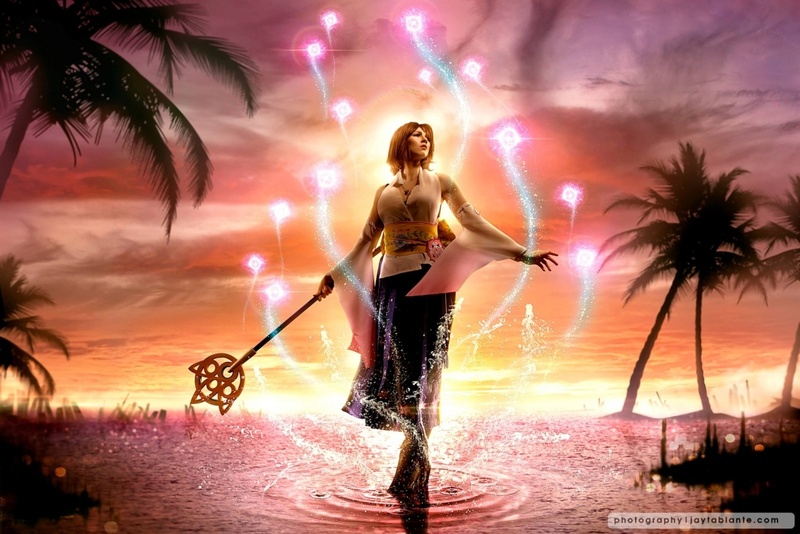 Few things that hindered me from working on a Yuna shoot, was finding the right cosplayer to work with. For me, casting and personification are a few of the crucial factors. Yuna stayed in the back burner (or what I personally call, concept cellar) until I had the chance to work with Nana this year. We were able to bring her in along with Enji Night for Comic Con Asia, so before the con mayhem began we took some R&R and brought them to the beach for the day. We did some beach sets, but it was this cosplay I was aiming to pull off. Though we did the main shoot in Batangas, getting the perfect afternoon shot was another matter. I had to rely on my bank of sunset shots taken in various beaches in the Philippines and blended them in to get the clouds and afternoon glow look. If you’d notice in the video, the sun was really high and we hardly had any decent clouds to work with. That’s the downside in doing things on-location.. you are subject to the weather. When it’s good, it’s good… when it’s off, well you have to make do with it. The ripples and water effects we’ve already banked before hand, and the sending spirits were a combination of shooting baby powder shooting out from the nozzle of the bottle, and then manipulating them with PS’s puppet warp feature. The glowing heads of the spirits were bubbles blown out from a bubble maker. The glow effect is rather rudimentary when you place multiple layers on top of it and blurring them. This was shot around 530PM, at the height of “magic” hour.. which is technically about 15 mins worth of that awesome sun. If you wanna see how we lit this scene up, here’s my behind-the-scenes clip.